2002 cal stone. a few question? Stand, FI info, manuals etc? I figured I would lump these here together... 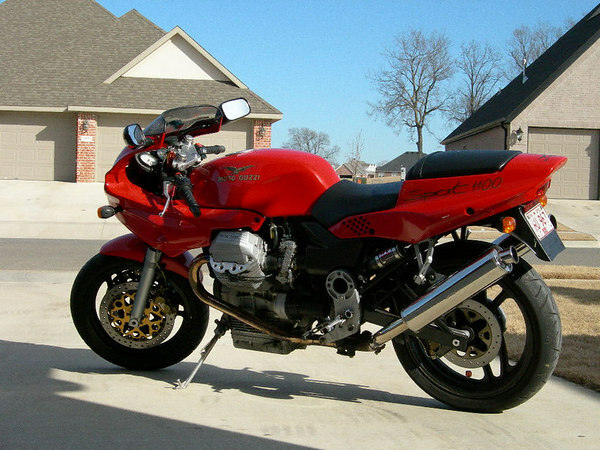 I just got a new to me Cali stone metal.. and a few things im wondering.. Im not new to Motorcycles, but this is my first guzzi. Ive been a fan for year, so have read a bit about them.. That being said... My bike came with a aftermarket cross pipe. also it has Lafranconi Riservato Competizioni mufflers on it. Its clearly louder then stock, and I assume freer flowing.. Do I need to worry about EFI work at all?? Unknown if anything was done to the mapping at all.. I havent got a chance to put miles on her yet, is there something I should be mindfull of keeping a eye out for? Ive worked with many FI cars... this is my first FI bike though..
Next, is a center stand. It seems to have brackets to mount one, but no stand. Where they a add on option? Are they still out there for sale? Manuals?? The owners manual that came with it is water damaged, so Ive got nothing right now. Is there a downloadable manual out there somewhere? Whats out there for service manuals? I do my own work, so manuals will be needed. And ill toss this hand grenade out there... Oil.... Most of what im finding in searching is oil used for newer, and older guzzis... Mine seems to be kinda in between eras... Im thinking id be looking for 10-60... Is that correct? Ratings, or brands I should be looking for? Thanks for any help you all can offer. Re: 2002 cal stone. a few question? Stand, FI info, manuals etc? Hydro uses 10-40. Anything fresh and clean, changed every 6,000 miles will work. The Cheaper the better for your wallet. "this old tractor" Greg Bender has a great web site with everything you need for reference material. Ride the bike. Service like any other motorcycle, clean, lube, check air. It will go 100,000 miles with regular maintenance. Yes, FI needs some looking after. Syncing and setting the TPS to fuel correctly, changing the fuel filter. You may have the TPS advanced a bit for the exhaust. I installed a Techlusion on a Stone Metal to bump up fuel, and have one on my EV for my stock ECU. The centerstand you can get on ebay or from bike brakers or even MG Cycle has all the parts, same w/Harpers. Oil is plain old 20W50 and 80W90 in trans & rear drive. ‘02 Stone may/probably NOT be a Hydro motor. If it is, 10/40 is NOT the proper oil. If I recall, it was the thinner 5/40. Is the engine paint rough black crinkle, or smooth? Do you see an external petcock/fuel pump? for efi mixture tuning search "guzzidiag". There are many conflicting tutorials on tps/throttle body tuning, I read alot, and then experimented. Once you get your head wrapped around it, using guzzidiag and throttle body adjustment is actually easier than tuning a set of carbs. Edit: Pull the valve covers to verify if the valves are adjustable, or if hydraulic that the recall was done. Engine is crinkle black.. Pulled valve covers and the rockers have adjuster screws. Doupt the covers have ever been off really.. they way the bolts popped as I loosened them!! If the bike is running well, and the plugs look good, then don't mess with the EFI. Do use an OEM paper airfilter in the airbox. 2002 is a solid lifter engine. Use 15w50 or 20w50 synthetic. I would use Mobil-1 V-Twin, if it were mine. Easy to find at any auto parts store. Frame is the same for EV, Bassa, Special, Jackal, Stone. Center stand was original equipment on the EV and Bassa. Optional on the Jackal and Stone. Check with MG Cycle or Harpers for centerstands, owners manuals, and shop manuals. Great thanks.. Ya, i planned on waiting till I got some miles under her before any changes..
Just figured I would toss a update out there... Still nothing on the FI tuning... being winter and all, and no riding miles for me or the bike.. Took a drive to Hamlin's in CT for some parts, and got my oil filter and sump gasket.. Picked up some Mobil 1 Vtwin oil, and once I get to run it and get some heat in ill change it. I adjusted the valves... no hydro motor here.. Still looking for a center stand. look like it has all the hardware there so just a matter of spending the time looking... All in all enjoying learning about this bike...and waiting for spring!!!! Good to hear your update. For the centerstand any Tonti one will fit. I put a stand from a '79 SP on my Jackal. Later model stands had extra bracing and a more substantial arm for deployment so that is what you are looking for.